Good Life and Anything Good In Between! While many were starting to flock Binondo in Manila for the Chinese New Year celebration, we decided to visit Tagaytay for a peace and quiet holiday. The newest add on to Bonifacio High Street. When we think about local travel, we often think of white sand beaches, nature parks, adrenaline nature adventures, festivities, or historical sites. But what if you need more than what a local travel brochure could offer? They say, to each of his own, but where would you go if you’re some sort of a bipolar traveler like me who wants nature and beach for a moment then suddenly shifts to mall hopping and enjoying the busy citylife? Well, that is what a "lifestyle destination" is for me. A place wherein you’re not restricted to what its branding has to offer but somehow suits to what your lifestyle needs. I haven’t resided in Davao since 2004 and I have been tossed between Metro Manila and Cebu since then. As of this writing, Im currently stuck and waiting for my flight here at Davao International Airport on my way back to Metro Manila where Im (for now) residing (but then again that’s another story - flight cancellations due the heavy rains in Metro Manila). It’s Kadayawan season and for the past few years, I’ve been making it a point to visit my hometown to celebrate the festivities. My yearly visits never fail to surprise me. There’s more to Davao than her beaches, her nature parks, her flora and fauna, the fruits, or the urban offerings. There’s more to Davao than being an adventure destination or a site for cultural tourism. I remember last 2012, when I went here in Davao – the activities I had were more into visiting nature parks and trying out some outdoor adventures. I went to the Island Garden City of Samal and spent a day at Maxima Aquafun and Hagimit Falls. I slid through the giant slide called the abyss and was dropped straight to the open ocean. I also visited Davao Crocodile Park and had tried rolling down a hill inside a zorb. The next day I found myself in one of the zipline parks in the city and zipped through two lines with lengths of around 600 meters long for the first zipline and followed by another 500 meters long zip with a speed of between 70 to 100 kilometers per hour at a height of 200 feet above the ground. But this year’s visit calls for a different adventure. I didn’t want to enjoy the outdoors but preferred to enjoy the city life away from the hustle and bustle of a bigger and more complicated metropolis that is Metro Manila. I wanted to enjoy what I always love doing in the big city minus the heavy and slow flow of traffic. I wanted to enjoy the city rush minus the irritating honking of buses. It may seem impossible but Davao was able to offer it. On my first night, Jong and I went to SM Lanang Premier. This mall reminds me of SM North Edsa and SM Aura in BGC. It has a skygarden but minus the noise of the buses that ply along EDSA and the absence of that scene where u can see people being restless, rushing to and fro the skygarden. It’s very relaxing, people are not in a hurry, indeed it’s a skygarden which name speaks for itself….a quiet and serene place to hangout and dine with friends. Then we went to the fountain area of the mall located at its rear portion and fronting Park Inn Hotel by Radisson. It’s a wide open space with an area that features colorful water fountains with some lightshows – as of now, it is the longest row of dancing water fountains in the Philippines. This water feature is a view to a row of popular restaurants such as Vikings, Murray’s New Orleans, just to name a few. Since it’s Kadayawan Festival, it’s also a venue for the ongoing Durian Fest. Before heading to our hotel, we visited Backyard Burger along Quirino – a roadside burger joint and bar showcasing gourmet tasting home made grilled burgers. I find it good however Jong told me that Gino’s burgers are way better. That’s something worth checking next time. The next night, another friend of mine (Christian) brought me to Karl’s Koffee Korner in Dacudao. It’s where one can enjoy live music at its al fresco area or savor private moments inside their cafe that offers a homey ambiance. That night, I was blessed enough to have watched Popong Landero’s live performance. To those who dont know him, he is a Dabawenyo artist who brought us songs such as Bahaghari Tayo and Rastamindanaw. Inspite of the live performances and good food, the price is quite affordable. If you want to jam with the artists, u can do so too. After, Karls', we ended the night through dropping by Metro Avenue located at the back of Gmall (just a few mins drive from Dacudao), an arcade of watering holes for younger Dabawenyos. I love to run, so on the next day, I decided to start my day through running around the city. In Metro Manila, I usually run from Mother Ignacia St to QC Circle (complete atleast three rounds) then head straight to UP Diliman’s Runners’ Loop. In Davao, I had the chance to run north bound from my hotel located along Roxas Avenue to Victoria Plaza’s grounds and up to Abreeza (an Ayala Business Park ). Abreeza is where one can find an Ayala mall, an urban lifestyle hotel, several condominium projects, a BPO facility and a corporate center. That night, a friend of mine (Raymund) invited me to join him and his friends at Hybrid. In my teenage years (late 90s and early 2ks), Hybrid was more popularly known as Wheels and More Drive - a place where I used to hangout and party with friends in bars such as AutoShop. Today, Wheels and More's signage can still be seen outside but most people refer to it as Hybrid. It's also the site for another bar called Starr. In the succeeding days, Jong and I had been to the extremes (as far as food tripping is concerned), tried the very affordable and practical Sinangag Express along F.Torres St. and tasted the a bit pricey Yamomomo Cheesecake at White House @ Northpoint. We’ve enjoyed the barbecues along Bonifacio Extension and the Blueberry Ensaymada topped with melted cheese at Green Coffee. In the past 7 days that Ive been in Davao – Ive enjoyed her other side. If in 2012, she was able to quench my thirst for outdoor adventures, this time Iv enjoyed her urban offerings - food trips, dining, and the city life. And if u want both, one doesn’t need to travel that far to enjoy both worlds, in fact, u just need to stay in the city and here u can enjoy the rustic rural life that serves a good setting for outdoor adventures or her city streets and lifestyle enclaves where one can enjoy an exciting but stress free urban living. Davao, for me, is indeed a lifestyle destination. It’s a city that can accommodate whatever what one needs. Do u need an adrenaline rush? Or a walk through memory lane? Do you want to experience our indigenous culture and tradition? Or get lost in the midst of a shopper’s paradise? Do you want to walk along our whitesand beaches? Or simply go white water rafting? Whatever your lifestyle needs – Davao is an awesome destination that can offer these. With that in mind, Im very excited for my next Kadayawan trip this coming 2014. Davao....surprise me up! If you want to lose weight and watch those calories or fat intake, well this blog post isnt for you. Hello, bagnet! My first encounter with a bagnet was through an officemate who brought me a kilo of it straight from Ilocos. And all I said to myself that time was "ngeee taba". But I was able to consume it all in less than 24 hours. Hello cholesterol! For me, eating bagnet is one of those "sinful pleasures" - not good to do it everyday, but probably nice if once in awhile or during certain celebrations or meet ups. So, last week my friend and I decided to visit this resto that offers dishes that has something to do with bagnet. 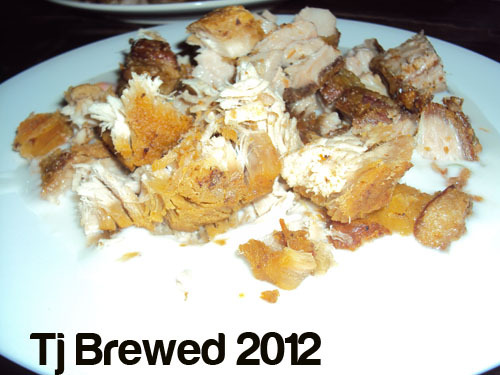 Hello 8065 Bagnet. 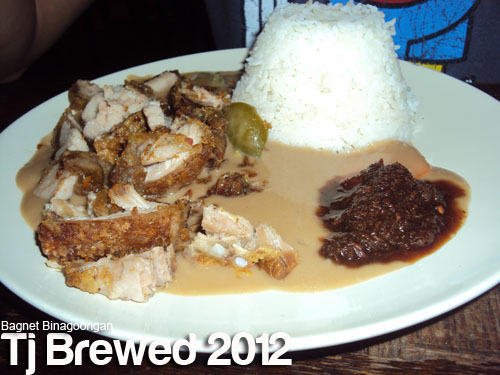 8065 Bagnet can be found in Estrella. 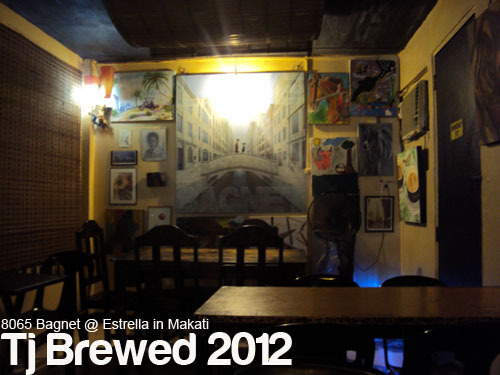 Now dont be confused with the other Estrella near Rockwell. 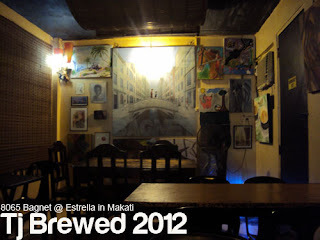 Dun kami pumunta kaya naligaw kami and spent more time looking for the right Estrella. 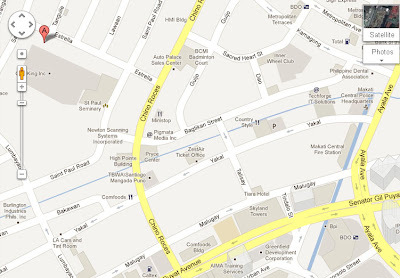 So if you're aint familiar with the place, consider this: if your coming from Ayala Avenue, when you reached RCBC Plaza - turn left (Sen Gil Puyat aka Buendia), then sa kanto ng Chino Roces aka Pasong Tamo (landmark: Export Bank Plaza where across it is a gasoline station) turn right, then at the fourth block turn left - you'd know that you've reached Estrella coz there's a welcome arc with Estrella written on it, then around 4 blocks from the welcome arc is 8065 Bagnet (left side). When we went there, it was around 2pm so we were the only ones around. It's a small and cozy watering hole. They offer free wifi access. There's some sort of a freedom wall where guests or diners can sign "hey i was here" or something. They also have this other wall filled with paintings and another area with old personal stuff like old pocket books, ids, even medals and trophies. Ive heard this resto is owned by Kitchie Nadal's brother. They said we should try their "original bagnet" but my friend opted to get a binoongan bagnet and i had a bagnet spicy gata. Im not really a good food critique (sensya na po - Ive never been one ehehe) but I was really satisfied with our orders. Good meal for a reasonable price. I still had shift last Friday but decided to meet up with a friend from Davao and toured him around BGC. 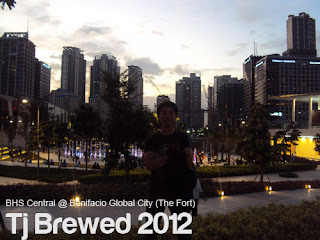 It wasnt his first time here but then again, there's more to Bonifacio Global City than the usual Market Market, Serendra, or Bonifacio Highstreet - where most visitors go. So we attempted to look for more, but sad to say we only had so little time. We met up @ Bonifacio Highstreet and from there visited BHS Central. Some sort of an expansion or extension of Bonifacio Highstreet, BHS Central is a landscaped area - twice the width of the current Bonifacio Highstreet, with gardens and an interactive water plaza and amphitheater as its centerpiece. The area also gives a stunning view of some parts of BGC's skyline. 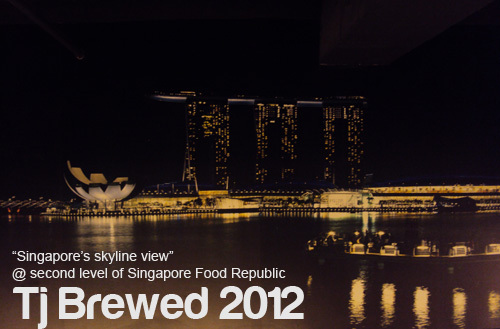 Unlike some business districts, here you can literally experience an expansive view of the city. 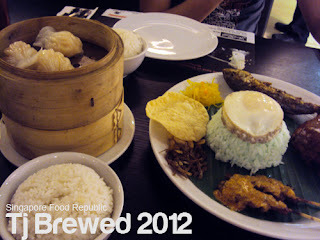 After BHS Central, we went to Singapore Food Republic which is located at Commercenter @ 4th Avenue corner 31st Street. 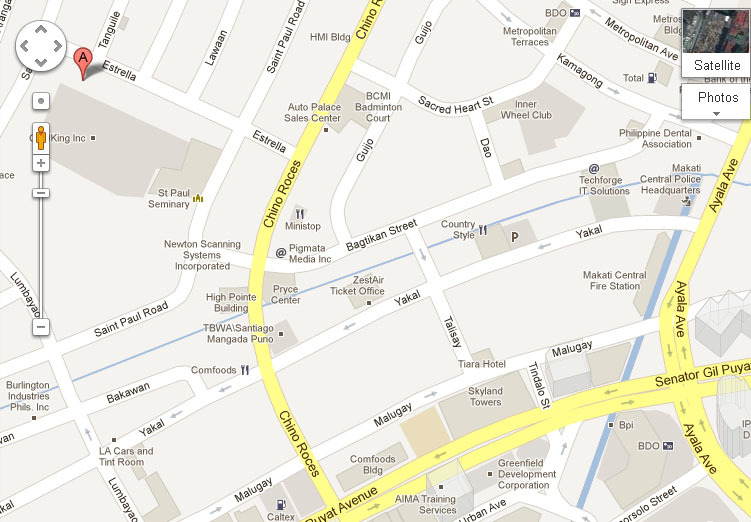 If you aint familiar with the streets in BGC, then just look for the Ferrari Showroom and St Lukes Medical Center. It's a cozy restaurant with friendly crews, not to mention the friendliest restaurant owner I've ever met thus far in my lifetime (to the point na sinubuan nya pa ako just to teach me how to taste their food differently with this shrimp paste he brought from Singapore). They have Singaporean Laksa and Iced Bandung - but err we didnt order that huhu. 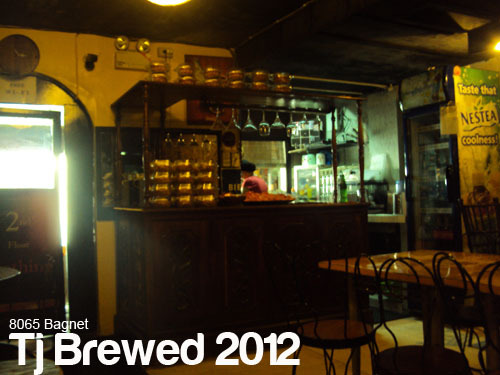 With its ambiance, food choices, and good service - the price is a-ok. It's a loft type restaurant so if you want to have that feel of being in Singapore, just go to the second level and there they have a panoramic view of Singapore's skyline. Commercenter - where Singapore Republic is located, is also home to other good cafes and restos such as Chatime (for milktea lovers), Relik Tapas Bar and Lounge (a good place to chill), and more. We needed to burn those extra calories we consumed hahaha so we walked from Commercenter to Burgos Circle. I personally love hanging out in Burgos Circle especially during afternoons when there's lesser crowd and lesser people walking their dogs around the circle ehehe. But since it's nighttime, people were starting to arrive and luxury cars were starting to line up (by the way, if u love cars - then try visiting the circle every Sunday morning, there you'll see some luxurious cars being parked around Burgos). From Burgos we went to Fort Strip. On our way to the strip, one can notice the soon to open Mind Museum. Located in the former JY Campos Park, it's something worth waiting and it's the first of its kind in the country. 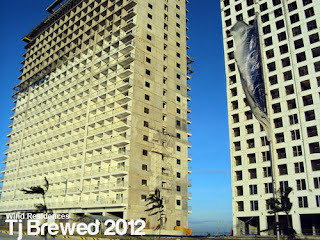 It had its soft launching last month but formal launching and opening to the public would be this coming March 2012. According to their corporate site - it will have five galleries which will feature the following - story of the univeres, story of earth, story of life, and story of technology. Built with the help of more than 50 scientists and designers, Mind Museum will rise in a 1.2 hectare lot @ the heart of BGC with 7,595 sqm as its floor area. Here's a 5 minute video I prepared for ya guys. 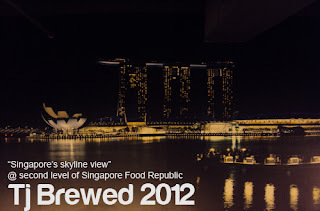 Click the youtube link above and join me with my first roadtrip for 2012. We left at around 5am from our place in Ortigas Extension. 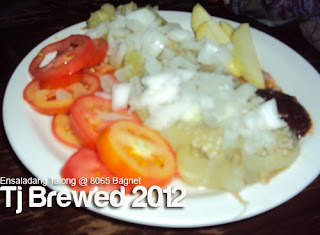 With several pit stops and taking a longer and less familiar route, we arrived in Tagaytay City at around 7am. Not bad, considering that it was our first time to take the Roxas Boulevard – Coastal Road – Bacoor – Aguinaldo Highway route. 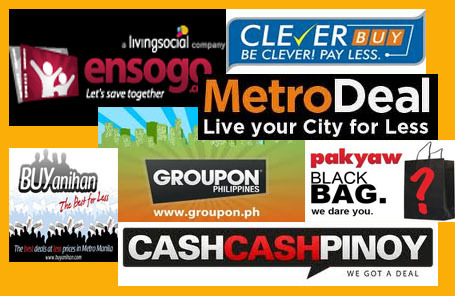 In all of our previous visits, we travel via SLEX which is the most popular route. 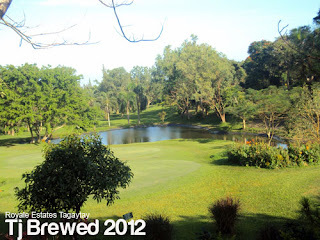 I like the fact that Tagaytay seems so far from busy Metro Manila yet so near – an hour or two drive away. Like everyone else, I love Tagaytay’s cold weather, its relaxing ambiance, and of course the view of Taal Lake. One of our stops was Summit Ridge Promenade. An open-air strip mall, Summit Ridge Promenade is owned and developed by Robinsons Land Corporation. It is one of the dozens of Robinsons Malls in the country today. This is not the first time that I’ve visited the mall and what I really love about it is its open air concept and al fresco dining options. It’s just a small commercial lifestyle center if compared to other malls and it doesn’t have its own department store but it offers what one immediately needs through its supermarket, restaurants, cafes, and bargain kiosks. 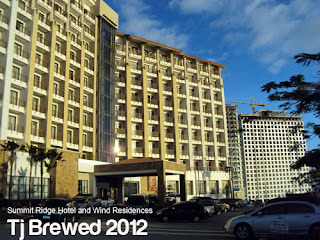 Few steps away from this promenade is Summit Ridge Hotel which is also owned by Robinsons Land. 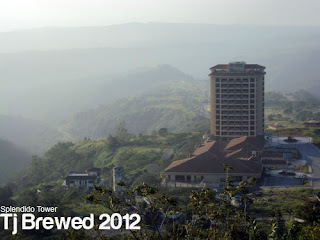 It has a Sky Lounge that offers a very nice view of Taal Lake. Their usual one night stay rate is around 5,000 plus pesos. A stone throw away from the hotel is Wind by SM Residences. Wind Residences is envisioned to be a 15 hectare property with ten 20 storey residential towers. As of today, they have already constructed two. After Summit Ridge, we had a stop in Ladera Grill at Splendido. Splendido is a project of Sta Lucia Realty Corp. What is nice about this pit stop is that it provides a different view of Taal Lake. From their viewing deck you can see the 250 hectare Splendido Golf and Country Club with its one imposing Splendido Tower and the lake. 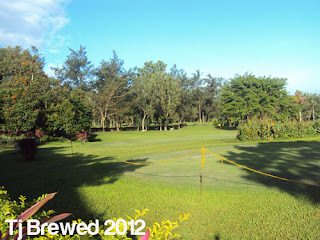 After enjoying the usual Taal view, this time around, we decided to visit Royale Estates Golf and Country Club. The estate is just one of the properties of Sta Lucia Realty in Tagaytay. If you are looking for peace and quiet, greeneries, and privacy – then Royale Estates Tagaytay is one of the places you can visit in Tagaytay. Well I've never been to many Country Clubs so I cannot really say that it's the best there is, but at that point in time, it was definitely a perfect spot for me to unwind, enjoy my restday, and relax. Not only that they have this golf course, but they have their own bowling alley inside the country club, some nice and cozy rooms if you wanna stay in for the night, a nice restaurant with al fresco dining, coffee shop, and cafe. On our way back home, I had the chance to turn on the radio and listened to some news. Tsinoys and Pinoys were so busy in Binondo and I can only imagine the celebration they had. Well, mine was different - it was quiet and still. It may be an unusual choice to celebrate Chinese New Year, but personally - for me it was the best chinese new year thus far.